Live fully! For, in the end, you are on your own…! Life does not conform to a blueprint you may create or a strategy you may conceive. Life simply happens to you. And the best you can do is go with the flow – following your heart, learning and unlearning from each experience, never grieving but, at the same time, never ever repeating something that appears to be a mistake to you! In the end, there are no right or wrong ways to live, you simply live! Period. Chances are you may not have heard of Psyche Abraham, renowned cartoonist Abu Abraham’s (1924~2002) wife, who passed away in Goa on Monday, July 15th. I too had not heard of her until I came across her unputdownable book ‘From Kippers to Karimeen: A Life’ (Roli Books, 2008). In a fascinating account of an eventful Life, where she bares her soul sharing details of her love Life__with three husbands and several lovers__and her six children, all of whom she always ‘abandoned’ and whom she eventually reconnected with in the latter part of her Life, Psyche epitomizes the “Life happens to you. Just go with the flow!” philosophy. 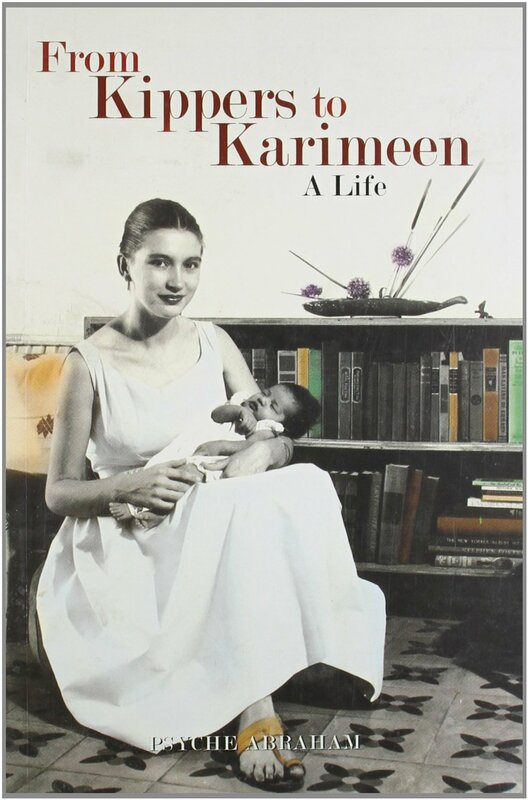 British-born Valerie Anne, later nicknamed Psyche, came to India in 1956 after marrying an Indian student Jhupu Adhikari (“a handsome Bengali”) who was then studying in England. They lived in Calcutta. They soon moved to Bombay where Jhupu took up a job in an ad agency. While Jhupu’s career took wing, Psyche began to feel that he was not interested in her anymore. They drifted apart and Psyche fell in love with Jhupu’s boss, Jog (“a very attractive man with a great deal of charm”). Psyche left her son Miti and daughter Sara with Jhupu and returned to England in preparation to marry Jog who was to divorce his American wife and join Psyche there. In the meantime that Jog came to England, Psyche had ended up have two more relationships. One of them led to her pregnancy, which, when she discovered she could not abort, led to the birth of her daughter Priya. Psyche gave Priya up for adoption and married Jog when he arrived in England. The couple moved back to India and Psyche had three children with him – Ini, Joya and Abhi. Soon, this marriage too was over, as Jog kept moving from one affair to another. And Psyche got involved with Abu Abraham, married him and they moved to Trivandrum to live in Abu’s Laurie Baker-designed home ‘Saranam’. She lived there till Abu passed away in 2002, and in subsequent years moved to Goa, where her son Ini was designing a Japanese style house made of coconut wood for her. Unfortunately, she died just ahead of that house being completed. You don’t have to agree with the Life she chose but you can’t but admire her courage to share it openly, humbly, objectively – without guilt, without grief. That’s my learning for the day! To fully live the Life you are given and that is happening to you, because, in the end, as Psyche reflects, you are on your own! Author AVIS ViswanathanPosted on July 17, 2013 March 14, 2016 Categories Abu Abraham, Art of Living, From Kippers to Karimeen, Inner Peace, Intelligent Living, Laurie Baker, Psyche Abraham, SaranamLeave a comment on Live fully! For, in the end, you are on your own…!